For the most part, discussion of climate change in the context of coverage of the recent flooding and destruction on the Louisiana coast doesn't exist. Traditionally, journalism about extreme weather -- particularly the recent slew of hurricanes like Juan -- does not take into consideration the possibility that global climate change might be partially responsible for the destruction that merits hours upon hours of coverage. Exceptions are rare, and usually brief. Coverage from the week following Hurricane Katrina's landfall has exemplified this dynamic. But at the margins -- and largely south of the border -- a polarized debate is stirring. In an article entitled "For They That Sow the Wind Shall Reap the Whirlwind", Robert F. Kennedy Jr. called attention to Mississippi Governor Haley Barbour's role in dismantling US support for the Kyoto protocol. Hurricane Katrina, Kennedy wrote, "is giving our nation a glimpse of the climate chaos we are bequeathing our children." In an opinion piece, Germany's Environment Minister Jürgen Trittin wrote that "[Bush] is closing his eyes to the economic and human costs his land and the world economy are suffering under natural catastrophes like Katrina," calling for a renewed commitment to Kyoto. A lone opinion piece in Mississippi's Clarion-Ledger entitled "Global Warming Beefs Up Hurricanes" pointed to a recent study linking the force of hurricanes to increases in water temperature due to climate change. Accusations flew of "exploiting the death and misery in New Orleans for their own political agenda" and "politicizing Katrina". Germany's Der Spiegel published a sampling of angry letters from Americans blasting Trittin for his insensitivity. "It is easy to assume that the recent rise in [the] number and ferocity [of hurricanes] is because of global warming," said the New York Times . "But that is not the case, scientists say," the Times continued. Cited by opponents of the first view as "one of the leading experts" on hurricanes, Dr. William M. Gray told the Times that hurricanes are a matter of "natural cycles" of weather. It depends on the question. Did human-caused climate change cause the massive and tragic devastation in New Orleans? Few scientists would be willing to endorse such a claim, due to the multiple possible factors involved. 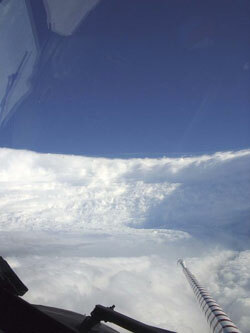 Dr. Kerry Emmanuel, the author of a July 2005 study published in Nature linking hurricane strength to rising temperatures, told the Times that "What we see in the Atlantic is mostly the natural swing." Emmanuel explained to Democracy Now : "we don't fully understand it... I don't think anyone pretends that we do, but there have been... periods of 20 or 30 years of inactivity followed by 20 or 30 years of activity," which are fairly regular. "Coastal flooding and erosion will increase because rising sea levels will generate higher storm surges even from minor storms." The Intergovernmental Panel on Climate Change (IPCC) seems to agree. The group's 2001 technical summary states that "There is little consistent evidence that shows changes... in tropical cyclones" from climate change. The report goes on to add, however, that "precipitation intensities... are likely to increase appreciably" with average temperatures rising globally, meaning that flooding is likely to be more substantial when hurricanes hit. Emmanuel's projections of hurricane force falls along these lines: "for every degree centigrade of warming of the tropical oceans, you might get about a five per cent increase in the peak winds." There are other questions, and other answers. 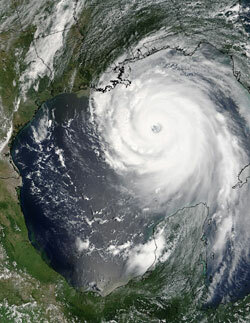 What is the effect of climate change in the impact of Hurricane Katrina and future storms? What is the role of human-caused ecological damages in the devastation currently on display? In March, a study published in Science by the National Center for Atmospheric Research (NCAR) stated that with a half-degree increase in ocean temperature, sea levels could rise 11 centimetres from thermal expansion alone (i.e. not counting melting glaciers, ice shelves, etc.). A 2003 report on climate change in the Gulf Coast region released by the Union of Concerned Scientists said that "coastal flooding and erosion will increase because rising sea levels will generate higher storm surges even from minor storms." "Whether or not global warming increases the number or intensity of hurricanes, future storm damages are likely to rise substantially because of the increased amount of development in harm's way and the aggravating impacts of higher sea levels and degraded coastal ecosystems," said the report. But climate change isn't the only human factor being examined in the aftermath of Katrina. In the online magazine Salon.com, former Clinton aide Sidney Blumenthal wrote that the Bush Administration "cut New Orleans flood control funding by 44 percent to pay for the Iraq war." Blumenthal also notes that the Bush Administration reversed a policy of restoring lost wetlands surrounding New Orleans, "unleashing developers" on wetlands. The result is greater damage from storms. "Every two miles of wetland between the Crescent City and the Gulf reduces a surge by half a foot," wrote Blumenthal. What continues to be the defining feature of the scientific and political debate, however, is that for the majority of the viewers and readers in Canada, there is no debate. According to the Union of Concerned Scientists, "raising people's concern and understanding of climate change would help to mobilize public support for climate protection." As of this writing, some Canadian media outlets -- a few CanWest Global papers and CBC online -- have reprinted an Associated Press article entitled "Katrina also whipped up warming debate," and subtitled "conclusive link to stronger hurricanes is still missing". Taking its cue from the New York Times , the story limits its scope to the question of whether climate change caused the hurricane, ignoring the concerns raised by scientists in recent months and years.